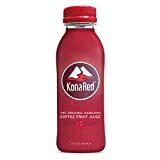 Kona Red is a juice product made from the fruit of the coffee plant or "coffee cherry" as it is often called. Usually the fruit is discarded and only the seed or bean is kept, which is then used to make coffee. Kona Red is creating a market for this fruit, which is high in antioxidants. They have a variety of drinks and most have slightly different caffeine amounts. 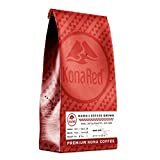 Kona Red is safe caffeine wise since most contain less caffeine per fluid once than a typical soda. All of these juice beverages contain either another juice or major ingredient since coffee berries have just a very subtle flavor on their own. The flesh of the coffee cherry is given a 218,400 ORAC value, which is a measurement of the antioxidant capacity it has. A wild blueberry is 13,427 for comparison. 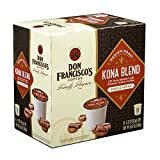 Kona Red also produces a line of powdered coffee cherry products but the caffeine of these is not listed. Sugar content: 38 grams (per 16 ounces). How Does Kona Red Compare? 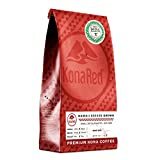 Kona Red contains 3.38 mgs of caffeine per fluid ounce (11.41mg/100 ml).